Red Bull teammates Max Verstappen and Daniel Ricciardo at the Azerbaijan Grand Prix. While things have been more fortunate this year, most of the 2017 Formula One season was an absolute parade. The numbers backed that up, with overtaking stats dropping in half from the year before. Now F1 just slipped new aero rules by to promote more passing next year, even as teams oppose them. Overtaking in F1 was more dismal last year than your rainy-day poetry. Total overtaking figures went from 866 in 2016 to 435 in 2017, and the average overtakes per race went from 41.2 in 2016 to 21.8 the next year. There was a grand total of one in the 2017 Russian Grand Prix. Williams cars testing in 2007, before the wider front wing (left), Kimi Raikkonen at the Abu Dhabi Grand Prix in 2009, with the wider wing (right). The new aerodynamics rules include a simpler front wing with a larger span and low outwash potential, simpler front brake ducts with no winglets, and a wider and deeper rear wing. F1 said in an announcement that the rules are to help with closer racing and more passing, and that they were approved by an e-vote. A lot of teams weren’t on board with the changes, but F1 slipped the rules by thanks to an arbitrary deadline of April 30, which Motorsport.com reports is the last day to get new technical regulations pushed through without a unanimous agreement. 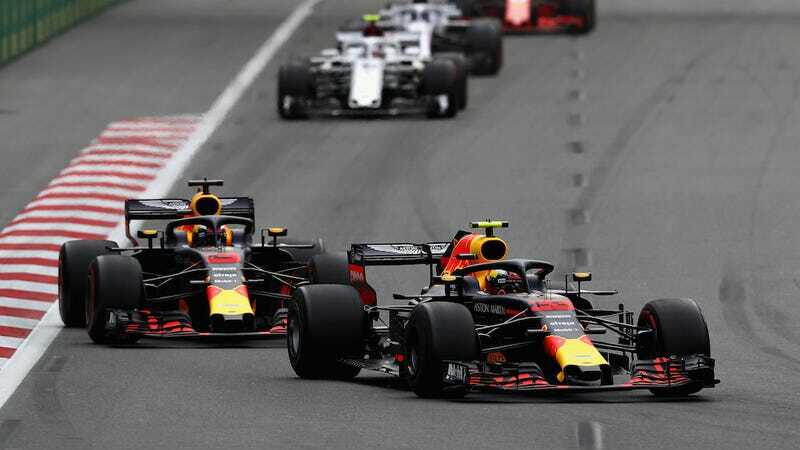 In fact, a proposal before that date could get through with as few as four of the 10 teams voting in favor so long as F1, the FIA, and representatives of sponsors and promoters agreed with it, according to the news site. Although there has been no official confirmation it is believed that when it came to the vote up to six teams were still opposed to the plans, with sources suggesting that Ferrari, Red Bull, Renault, McLaren, Toro Rosso and Haas said no, and that Williams was joined by Mercedes, Force India and Sauber in voting yes. [...] The wing changes proposal was a direct response to the lack of overtaking in the Australian GP, which prompted the FIA and Liberty to look for ways to make improvements for 2019. They were able to draw on some of the research already conducted by F1’s team of engineers for the 2021 package. As previously reported, a meeting of team technical bosses in Bahrain failed to come to a firm conclusion on the ideas put forward in what had become a joint FIA/F1 project. Team heads against the aero rules echoed each other to Motorsport.com, basically saying no huge changes are needed before the planned 2021 rules overhaul. “F1 is good enough for the next two years.” That’s more complacent than every F1 driver was with their position in the Russian Grand Prix last year.